As the team most likely to take on the $5.5MM remaining on Ricky Nolasco's contract, the Dodgers were seen as the trade market frontrunners leading up to their July 6th acquisition of the pitcher from the Marlins. The Marlins failed to receive top-tier prospects, and even threw in international pool money for the Dodgers. None of that came as a big surprise, not just because the Marlins like to save money, but because as ESPN's Keith Law put it, Nolasco was a "durable fourth starter type" who had a 3.85 ERA at the time. Free agency has a large "what have you done for me lately" element, and it seems that Nolasco's 2.07 ERA in 74 innings with the Dodgers has changed the conversation about him from salary dump to coveted potential top ten free agent. Nolasco won't turn 31 until December. Comparable free agents like Ervin Santana and Scott Feldman are the same age, and these pitchers are young enough to justify a three-year deal. One of Nolasco's biggest strengths is avoiding the free pass. Since 2011, he's walked only 2.05 batters per nine innings, which ranks 14th among starting pitchers with at least 400 innings. Five free agent starters have done better, the youngest of whom is Dan Haren, who turns 33 next week. On a related note, Nolasco has authored four seasons in his career with a K/BB ratio above 3.5, including this one. Only three free agent starters have a better K/BB ratio than Nolasco this year. Nolasco also scores points for durability, as he'll have made at least 31 regular season starts in each of the last three seasons. Only four other free agent starters will be able to make the same claim. Says agent Matt Sosnick, "It's been my experience that guys get paid for being healthy consistently every year." You may not buy into it, but Sosnick will also make the claim that finally getting out of Miami rejuvenated his client's career. Nolasco's 2.07 ERA since July 6th ranks fifth in all of baseball, putting him in company with teammates Zack Greinke and Clayton Kershaw and former teammate Jose Fernandez (Jarred Cosart sneaks in there as well). Sosnick adds, "When he pitches at home in front of his family in L.A., he's basically unhittable." One key advantage Nolasco has to a comparable free agent starter like Santana is that Nolasco is ineligible to receive a qualifying offer, having been traded midseason. 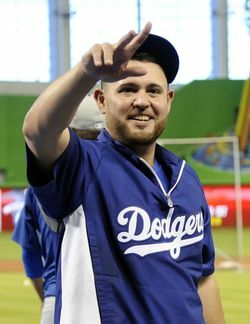 In December 2012, after Nolasco became the Marlins' highest-paid player following a series of trades, Sosnick told ESPN's Jerry Crasnick, "If he had his druthers, he would pitch for somebody other than the Marlins in 2013 and beyond." Opening the season with the Marlins, however, ultimately gave Nolasco's free agent value a boost, as he doesn't have to worry about having draft pick compensation attached. There is a good case to be made that Nolasco is simply a 3.80 ERA type who had a nice 12-start run. My ERA estimator of choice, SIERA, has him at 3.71 this year, as opposed to his actual 3.14 mark. Nolasco has allowed 8.2 hits per nine innings in 2013, after allowing 10.4 in 2011-12. Limiting hits isn't a skill if the pitcher can't do it year in and year out, despite Sosnick's "unhittable" comment. Nolasco's strikeout rate this year is a workable 7.3 per nine innings, but it was 6.2 per nine from 2011-12. He's currently sporting what would be the best home run rate of his career (0.77 per nine innings), but it's owed more to only 8.8% of his flyballs leaving the yard, rather than to a more reliable higher groundball rate. Nolasco is a flyball pitcher, and moving forward should be expected to give up more home runs and hits perhaps with a lower strikeout rate. As far as the "getting out of Miami" boost to Nolasco's numbers, his groundball rate is up a tick, and he's in front of a better defense. Still, the best bet is to pay for the innings and a 3.80 ERA. Nolasco grew up rooting for the Dodgers in Rialto, California, and described the trade as a "dream come true" in a statement. Nolasco, whose full name is Carlos Enrique, is close with his brother Dave, a former Brewers minor league pitcher. During the offseason, Ricky can be found in the desert almost every weekend, camping with friends and driving sand rail dune buggies. Nolasco's statement upon his trade to the Dodgers also included the line, "I couldn't be more excited to play in front of my family and friends in Dodger Stadium during the season, and hopefully for many more seasons to come." In other words, "I'm very interested in a contract extension, by the way." The most likely scenario has to be a contract extension with the Dodgers before Nolasco hits the open market. Nolasco has pitched well for the Dodgers and wants to stay, and he's got an extension-friendly agent in Sosnick. Nolasco's apparent eagerness to pitch for the Dodgers may reduce his leverage, but he has already banked about $34MM in his career, mostly from a 2010 extension with the Marlins totaling $27MM. He definitely came out several million ahead on that deal, as the Marlins might have eventually non-tendered him otherwise. Already having a large measure of financial security restores some of Nolasco's leverage. If the Dodgers and Nolasco can't find common ground, perhaps he'd first turn to other California teams like the Angels and Giants. American League teams, however, could be wary of Nolasco, as he's an NL lifer. The Phillies and Mets may be on the lookout for starting pitching, as well as the Indians if the AL isn't an issue. The Giants, Rockies, Rangers, Padres, and Orioles had trade interest in Nolasco during the summer. An agent recently told me he focuses much more on years than average annual value, because teams and agents generally know the likely AAV range before they even begin negotiating. Nolasco should have no problem finding three years; the big question is whether the Dodgers or another team will offer four. Sosnick will probably begin there, explaining why his client is on par with Edwin Jackson and Mark Buehrle, and one of the best in a weak market. Jackson, Buehrle, and Nolasco are all durable 200 inning types, but Jackson hit the market at 29 and brought the allure of a 93-94 mile per hour fastball. Buehrle was two years older than Nolasco, but also had better career numbers. Plus, Buehrle's four-year, $58MM contract was something of a fluke — the Marlins were reportedly the only team offering the fourth year, as they were in the midst of a new ballpark spending spree. Then again, it only takes one team to guarantee that fourth year, making the Jackson contract Nolasco's likely ceiling.